I'm always trying new products, some not so good and never mentioned on my blog and others that I really enjoy and are definitely worth mentioning. I'm a beauty junkie. I studied in skin care and care about what I put on my face and body. If you see my bathroom cabinet, you'll know I'm not lying and may think I may have a problem. I'm not denying it. Here are the three I've recently used and two I'm still using. 1. Caudalie Make-up removing cleaning oil: I don't think I've ever found a cleanser that was oil based that left my skin feeling clean and moisturized. I've used many oil cleansers that always left me feeling still oily and not quite satisfied with how it removed my make-up. When I do remember to remove my make-up at night (I often get lazy or am too tired to even bother), I'm using it. Caudalie's utilizes grape seed and sweet almond oil for a more hydrating result. So if you're tired of the one your using, give this one a try, I promise, you're going to love it. 2. 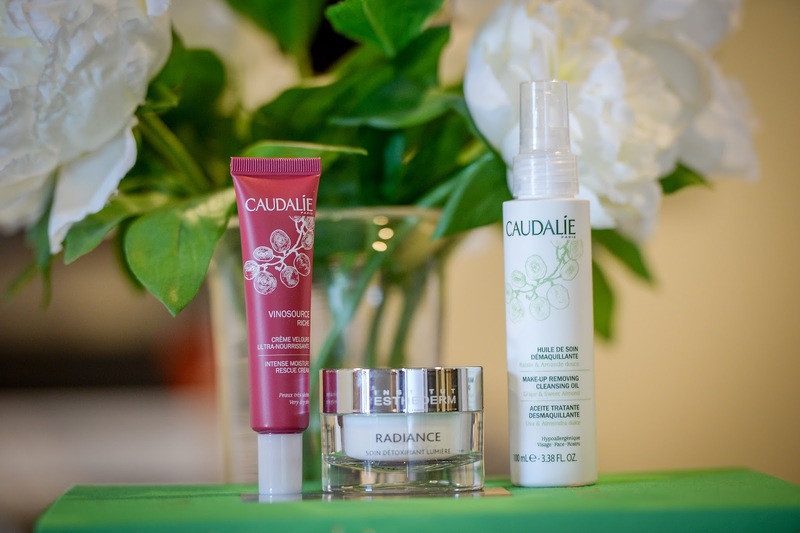 Caudalie Vinosource: If you're looking for a delicate and effective beauty routine with ultra-natural formulas, then look no further. I used the one for very dry/dehydrated skin cause at the end of February, my face was extremely dry due to the cold weather. I needed something that was going to restore, comfort, and heal my skin. Within a week, I already noticed that the flakiness was gone and my skin started to regain it's strength. Whenever I feel my skin needs some extra love, I'll grab this. Included in this collection are four moisturizers : a moisturizing sorbet, a moisturizing mattifying fluid, a moisture recovery cream and an intense moisture rescue cream (this is the one I used), so you're sure to find the perfect one your skin may be needing. 3. Esthederm Radiance cream: I've been using this cream for a few weeks now and the one thing I've noticed is how radiant my complexion is without any make-up on. It has helped even my skin tone. I've been using this day and night. The cream is smooth, non greasy and has a non-sticky finish. This cream is a little on the pricier side, but worth the splurge.